Hey Everyone! Hope you are all okay! As you are reading this post I am currently getting ready to go out to Central London to treat my brother. This will involve shopping, going out for dinner and then going to see the incredible Les Miserables at the Queens Theatre tonight. Something I am so incredibly excited about as ever since coming across the 25th Anniversary of the show it's been one of my favourite musicals and something I've wanted to witness in the West End. My brother, Mum and Dad all go on holiday for two weeks on Friday and I'm staying at home due to work commitments so I've just decided to treat my brother a little bit. I can't wait, but enough of that mini life update, time to get back into the point of this post. This is my 300th ever blog post. How insane is that? Because of that I decided that today I would write a little bit of a motivational post. Recently in blogger chats I've seen a lot of people comparing themselves to other bloggers and putting themselves down and just not feeling like they are a decent blogger and even though I can totally relate to this it wasn't nice to see at all! I decided to sit down the other day and put together a little list of why us bloggers are absolutely incredible and why we should give ourselves a lot more credit so I thought why not share it with all of you on my blog today! Enjoy! 1. You have a hobby. Many people out there are still stuck trying to look for that one thing that makes them happy. One thing that they can do on a regular basis and something that makes them extremely happy. You already have that with your and forgive me for the cringiness, little piece of the internet. You go to work or college or uni, you come back and you work on your blog and try and better yourself at your hobby instead of going to take a 5 hour long nap or sitting on the couch and watching TV and doing nothing else. All of us blog with any spare time we have and that time is precious that could be spent doing other things. Dedicating your own time to blogging is pretty incredible and shows commitment which is definitely something that can help you in the future! 2. You don't just worry about your own blog. You worry about other blogs too. You give other girls and guys helpful tips through your posts or tweets. You help them out and encourage them, you follow them and share their posts if it is something you like. You are incredibly supportive and that definitely makes you a fantastic blogger and shows how caring, supportive and encouraging you are too which are all fantastic traits to have. The blogging community would not be as friendly or amazing without you so well done! 3. Your blog is all you. Your writing, your photos, your ideas, your opinions. Everything on that blog screams you. Nothing is fake or unrealistic. All these things can help inspire and encourage other people and that's a pretty powerful and amazing thing to do. We live in a generation where everything tends to be spoon fed to us through the world wide web. If we want to find something we tend to google it and it pops up on screen in a number of seconds. However instead of relying on other people's opinions we throw our own two cents in and share what we think with others. Your opinion matters to probably hundreds of people and that's absolutely fantastic. 4. Whether you have 10 followers, 100 followers or even 1000 followers, you've gained a small following of people who want to come and read your blog and are interested in whatever you have to say. That's pretty incredible. Some people work so hard for months to get noticed by even one person so no matter how small your milestone you should be incredibly proud of yourself. Don't worry about not being that pretty fashionable blogger with 100,000 followers. Be proud of what you've accomplished so far. Every step no matter how small counts and is something to be congratulated! 5. 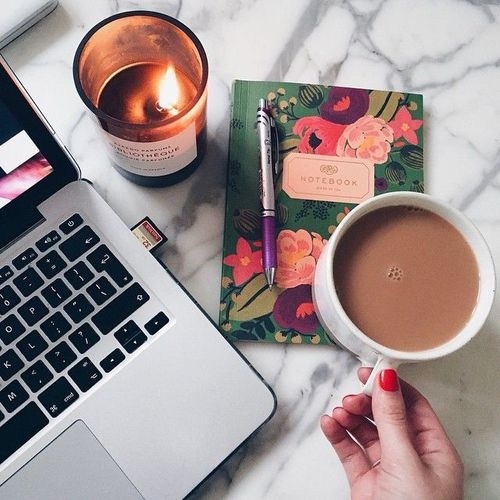 Lastly but not least blogging is hard work and at times can be super stressful so if you are a relatively new blogger or whether you have been blogging for years. You've bitten the bullet and gotten through all the stress. It's not an easy task coming into a community that is becoming increasingly more prominent and joining in especially with the amount of pressure there is nowadays but you are getting through it and loving it and that's something you should be so incredibly proud of. So there we have it. Five small reasons as to why you are an amazing blogger. Just remember to never ever compare yourself to other bloggers and to never ever put yourself down about your blog as no matter what you blog about you are sharing your passion on the internet where potentially hundreds of people will see it and that's a pretty incredible thing to do. Forget how many people are following your blog. Everyone has to start somewhere and if you love what you do then that is the most important thing. That love and passion will bounce off the screen and other people will love what you do too. The blogging community is not an easy place to be at times but you are here. Blogging is fun and the community is a really fun, warm and welcoming place to be. If you ever need advice or a little bit of motivation then feel free to tweet me at xbellefleurx or comment below or even send me an email (link at the side of my blog). I'll always be here to chat about any worries you have and will 100% support you all! Now grab yourselves a glass of champagne/prosecco/rose and congratulate yourself on the fantastic blogger you are. Great post hun, there needs to be more people and bloggers out there like you who are encouraging and supportive to others :). Everything you wrote is so relatable and true and will definitely inspire and help other bloggers. I'll have to have a sip of my fizzy Vimto to celebrate as I'm pregnant :). Such a lovely post and EXACTLY what I needed. I try and tell myself NOT to compare myself to other bloggers but it can be quite hard when all do is read blogs. But blog posts like this are so lovely to read, and not in a bad way but it's nice to know other bloggers feel the same and I'm not the only one who can't help but put myself and my blog down. This is such a lovely post! Usually post about blogging talking about things you're doing wrong or how to improve! This positive outlook is so refreshing :) I especially like reason #3. This is really the positive vibe I needed to read. I feel like a terrible blogger right now because I am so busy, but your lovely post has really perked me back up. Thank you!